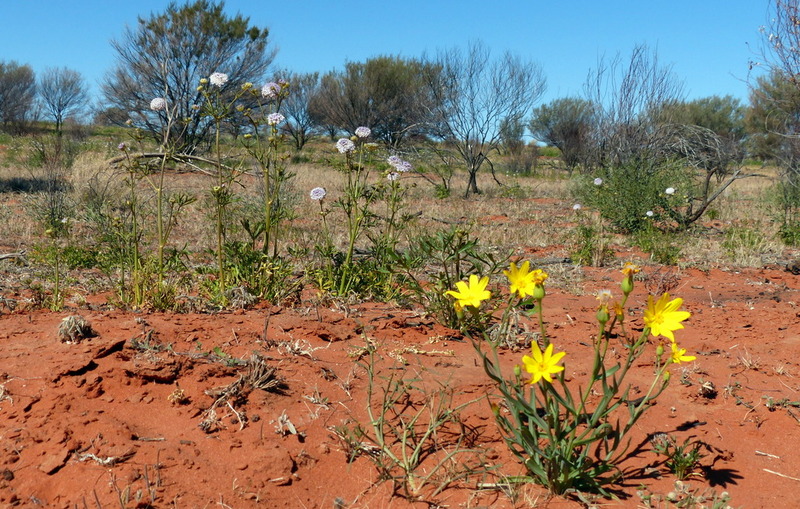 There was only one other couple sharing the Olive Downs camp ground with us and as they had driven up from Tibooburra after speaking with a ranger they had information regarding the 4 WD track across to Fort Grey camp-ground which was reportedly in very good condition. So we packed up camp after our morning walk and had a pleasant drive to Fort Grey stopping on numerous occasions to look at plants or enjoy birds such as the Chestnut-breasted Quail-thrush that Allen spotted as we were driving along. No decent photos of the Quail-thrush but we did have a great view of him perched on a dead branch, then feeding on the ground and so well camouflaged that he would be hard to spot unless you caught some movement. 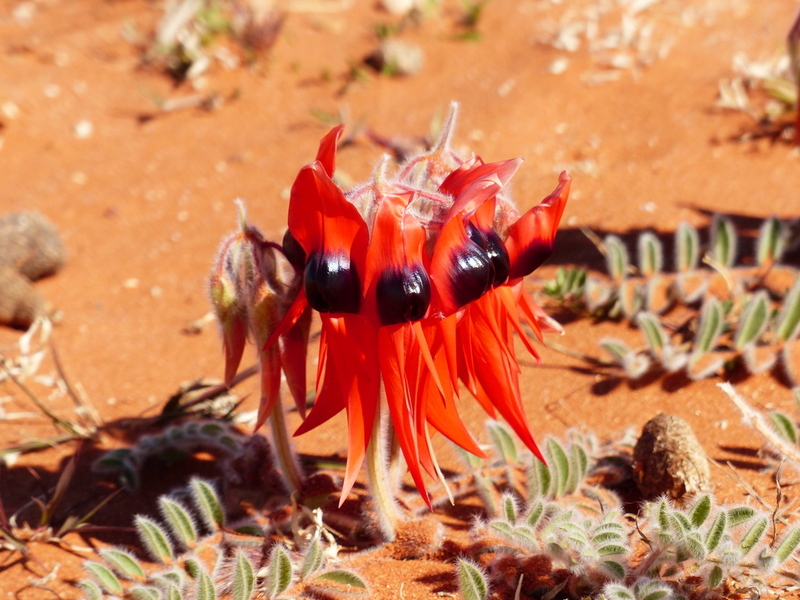 Then there was a patch of Sturt’s Desert Pea – (Swainsona formosa) just under the sign for the camp-ground what a brilliant sight! Fort Grey is a large camping area but only a maximum of 4 couples were there during the nights we stayed. It was as quiet as Olive Downs – if you could hear a vehicle then it was driving into the camp – absolutely no distant roar or rumble of traffic. It is rare to be able to enjoy such an absence of man-made noise nowadays and without any phone reception there were no outside distractions. Just the bird calls and the occasional gentle thump of a macropod moving by. 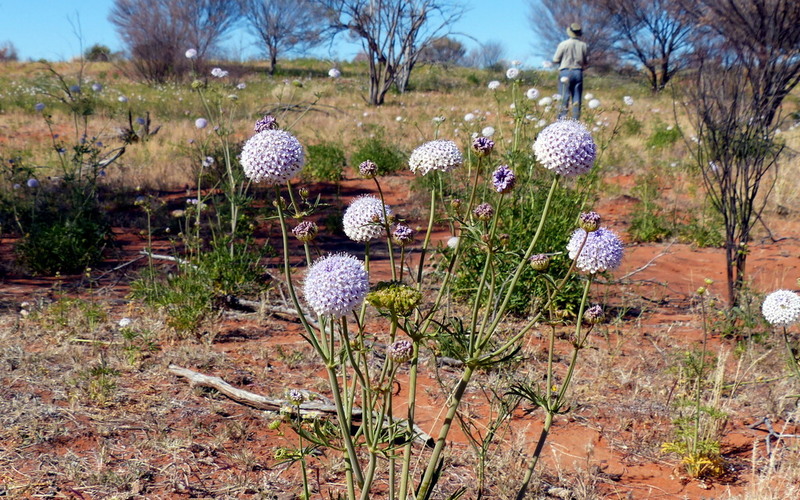 Its a short stroll to Lake Pinaroo – quite breathtakingly beautiful in the mid-afternoon light. 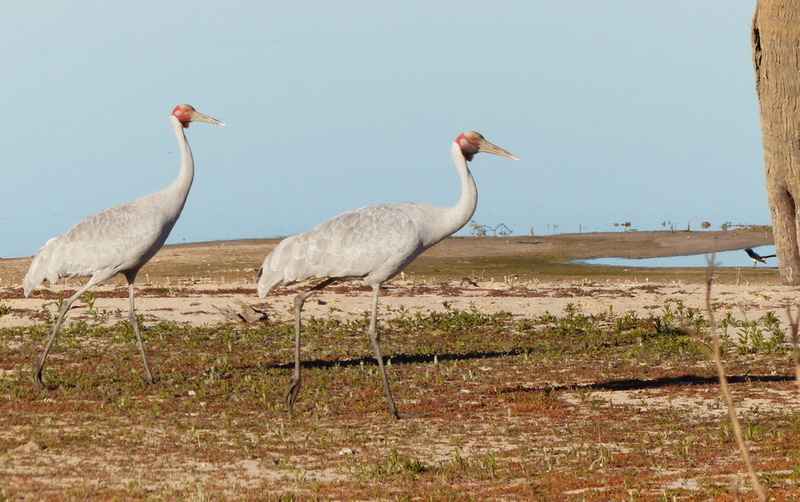 Rafts of duck, trees decorated with roosting Little Corellas, a trio of Brolga strolling along the shore and mirror-like reflections in the glassy surface of the water. 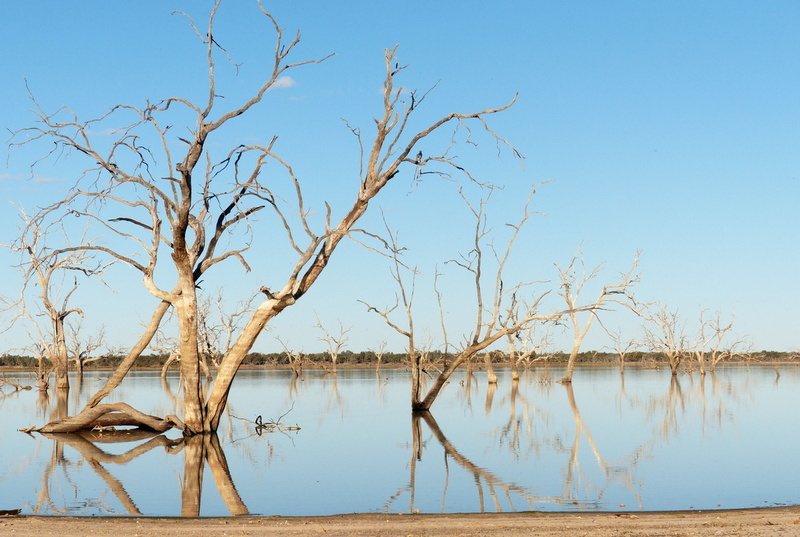 Coolibah trees that drowned in the huge floods in 1974 provide wonderful perching places for numerous birds but also give the lake a somewhat eerie atmosphere. Large flocks of Grey Teal, Pink-eared Duck, with a few Freckled Duck and Musk Duck, also Australasian Grebe, Eurasian Coot and a variety of Cormorants. Large numbers of Tree Martins flew around us feeding – lovely to see them perch and preen for a bit in the afternoon light. 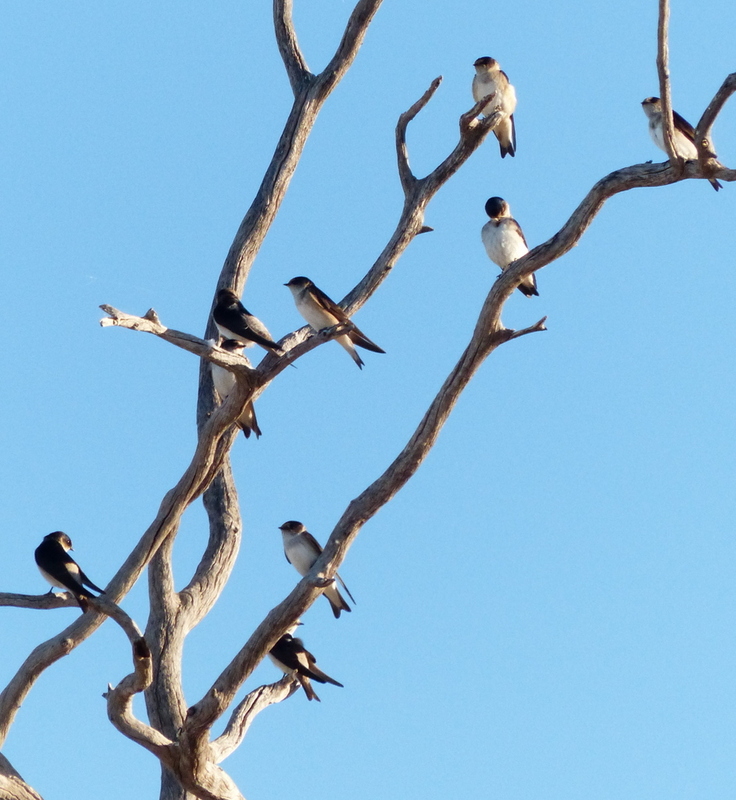 On a morning walk the atmosphere was more hectic with Spiny cheeked and White-plumed honeyeaters feeding frantically with budgies in the flowering Eucalypts. 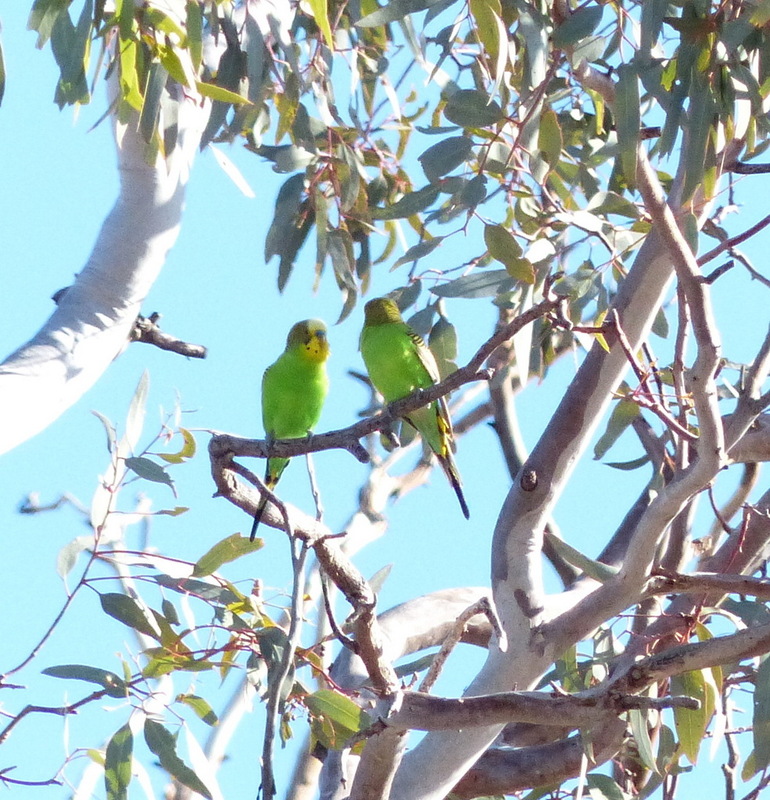 I never tire of watching budgies, for me they are one of the great delights of travelling inland.